Contact us to set up a testride at our shop in Northampton, MA! 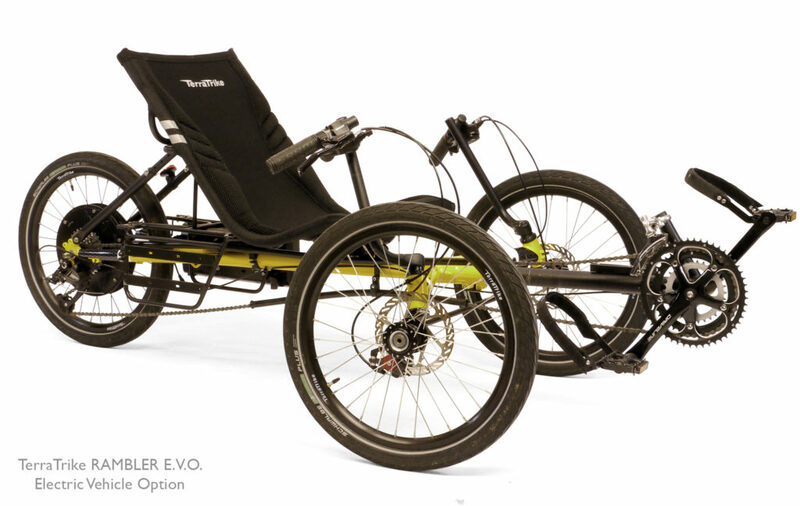 TerraTrike is excited to offer the Rambler with the Electric Vehicle Option (or “E.V.O.”, for short). This trike will transform the way you ride and will increase your range by degrees of magnitude. 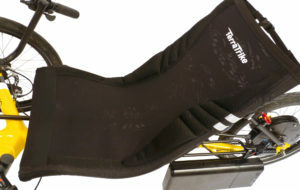 It will allow you to climb hills that were previously daunting, and it will keep you spinning through rolling terrain. The Rambler E.V.O. is not intended to be an electric trike. The E.V.O. was designed to help you along your journey, while you still get the cardio benefits of trike riding. You will hear and feel the motor turning on and off as it senses your need for assistance. You will still be shifting the trike as you normally would; as the hills get steeper, or as you come to a stop. Check out this detailed review from Bentrideronline. 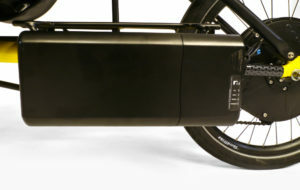 The TerraTrike EVO battery is positioned with a low center of gravity. It can be easily removed for recharging. The Rambler E.V.O. is pretty simple to ride, and loads of fun! You turn on the battery and ride away! With a generous range of up to 60 miles* per charge, you will have nearly limitless potential. The lithium ion battery can be charged overnight with the included “smart” charger. Simply plug the charger into a nearby outlet, or the battery can be easily removed from its case for charging in a different location. The charger is “smart” and will not overcharge the battery, so you will always be ready for your next adventure! The Rambler E.V.O. motor is pre-programmed so no user set-up is needed. We figured out the ideal torque sensor setting and assist level so that it is very predictable and optimized for assistance and range. The top speed is governed at 20 mph. Can the program be changed from stock? The answer is yes, and there is an accessory that you can get exclusively from your authorized TerraTrike dealer to change the way the motor behaves. The Rambler E.V.O. motor control accessory is called the ‘Wired Plus Minus’, or WPM. The trike will still be limited to 20mph, but you will be able to adjust the level of assist (low, medium or high) and you’ll be able to put your E.V.O. into one of three regenerative modes, which actually charges the battery on long descents. 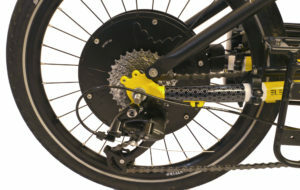 View of the TerraTrike EVO battery and hub motor below and behind the seat. The EVO’s optional Wired Plus Minus allows you to adjust the level of assist, and it also adds a reverse gear. The optional Wired Plus Minus allows you to adjust the level of assist, and it also adds a reverse gear. 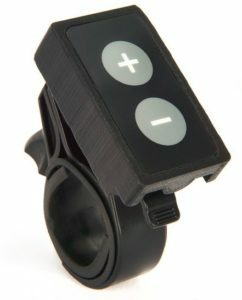 With the WPM you simply push and hold down the minus button and after a couple of seconds the trike starts to back up. You will need to back pedal while it is backing up due to the drivetrain of the trike. But don’t worry…max speed in reverse is 2 mph. And, not only will this trike back up, but it can also help you out if you forget to downshift. Let’s say that you are riding along enjoying the scenery so much that you neglected to shift into a lower gear before coming to a stop. Or maybe you need to stop halfway up a hill. We all know how difficult it can be to begin to pedal uphill in the wrong gear. The Wired Plus Minus takes care of that with the “crawl” feature. Just as you pushed and held the minus button to crawl backward for reverse gear, you push and hold the plus button to go forward. It too is limited to 2 mph, and is merely intended to get the trike rolling so that you can begin your pedal stroke. After it starts to move, and you start to pedal, you can let go of the plus button and the motor assist will kick in as appropriate. The Rambler E.V.O. is something really special! A trike that senses the assistance you need, and accessories from dealers if you desire to enhance the standard settings. Contact us to set up a testride at our shop in Northampton, MA and see for yourself!